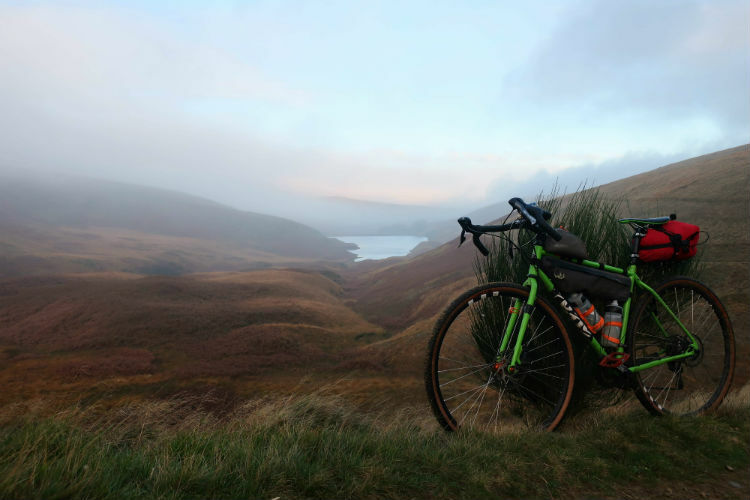 Bike Rehab regular Chris embarked on a tour through the hills of the north, following tracks and paths less travelled. Heres how the adventure goes. It feels almost too easy. It took less than an hour to pull up a few .gpx files and identify ways to link them up. No need to pore over paper maps, noting the terrain and counting contours. Routes that were once imagined, explored, tested. Routes passed on in the field, or by word of mouth over a kitchen table covered in cartography and mugs of tea. With the advent of the internet, I can now tap into years of knowledge in the blink of an eye. I can instantly see gradients (and imagine how my legs will feel as I slog my way up them). We look briefly at the map, and then start navigating by feel and guesswork. 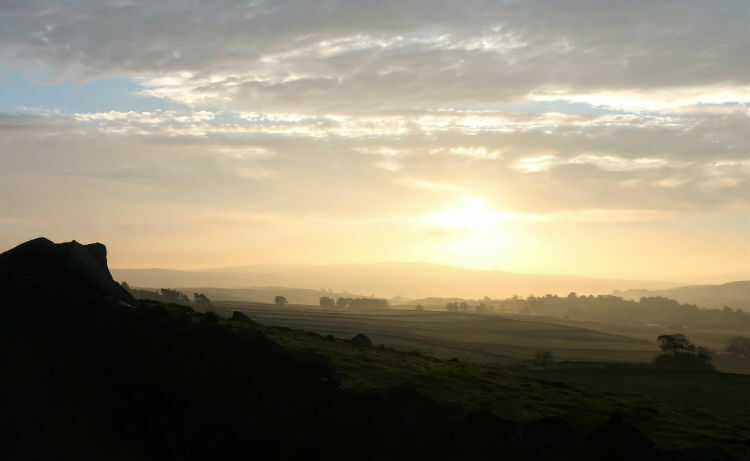 Surprisingly, this works, and we climb up through Embsay to a backdrop of glorious mists and sunrise. We continue up the hill, then swing off the road and onto the moors. So far, so good. Things the internet doesn’t tell you 1: where the grip is. Or isn’t. 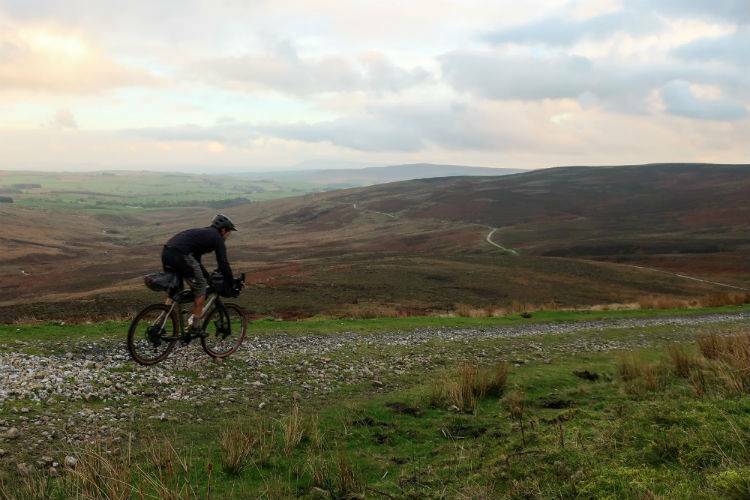 Country lanes speed us through Rylstone and Hetton, then we head up onto the moors again. Here, Don encounters a bit of zero-traction action, his “road plus” tyres finding the local limestone to be more slippery than the grit we’re used to. 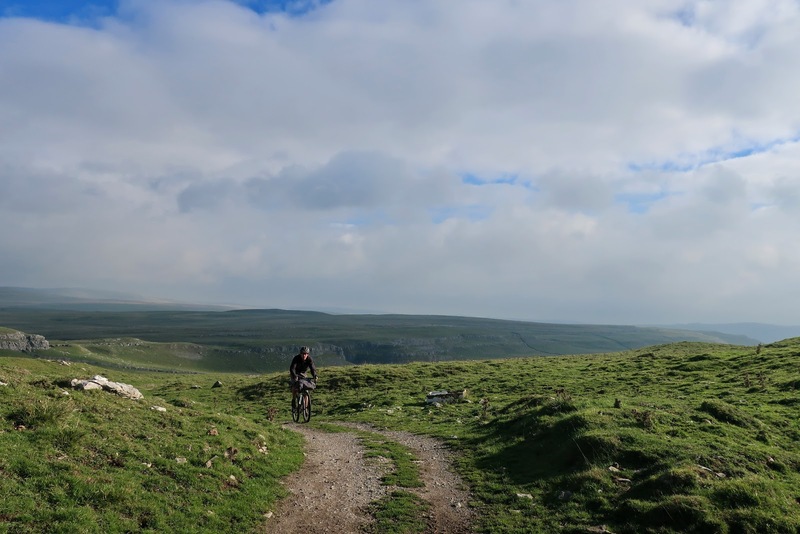 Eschewing the chance to ride around Malham Tarn, we point downhill towards Malham itself in search of elevenses, which we take at the Old Barn Café. We then have to regain all that lost altitude, the road up past Malham Cove stirring memories of an unsuccessful audax and an exploded knee. Taking it steadily this time, we make good progress, and we’re half-way up before I look across at Don and think, “I’m sure his gears aren’t that much lower than mine!” I realise I’m still in the big ring – what a doofus. Granny ring engaged, we twiddle on up, before leaving the tarmac for the Pennine Bridleway. Things the internet doesn’t tell you 2: where the sheep will be on the road. As we head down into Settle, we encounter the local traffic calming measures – escaped sheep – before zipping down the hill towards lunch. And beer. The Talbot Arms is highly rated by CAMRA, but its pool team has had a dip in form – they were only runners up in the local league this season, down from the lofty heights of champions. Things the internet doesn’t tell you 3: a lack of contour lines doesn’t always mean it’s flat. From Settle, we pick up the Dales Cycleway, which we follow to Wray, passing hedgerows teeming with rosehips, bilberries and hawthorn. There are no big hills along this section, but it’s rolling to say the least! Wray’s pub isn’t open all hours, so we descend on the local post office/shop/café/dispensing chemist. A cafétiere prepares us for what we think will be the last challenge of the day. We’d checked the map, and noted the steep hill chevrons, but blimey! We struggle out of the valley, and Don hopefully points at the lesser of the two hills facing us. I’m not convinced, and bet on the larger, darker, cloudier option. Thankfully, Don is right! It’s still a big old climb though, up Hornby Road and onto the moors of Salter Fell. The surface alternates between smooth gravel and oversized marbles. By the end of it, Don is vowing to ride flat pedals next time. Things the internet doesn’t tell you 4: That longed for downhill is actually covered with ruts and rocks. We reach the watershed and celebrate by breaking out our whisky flasks! 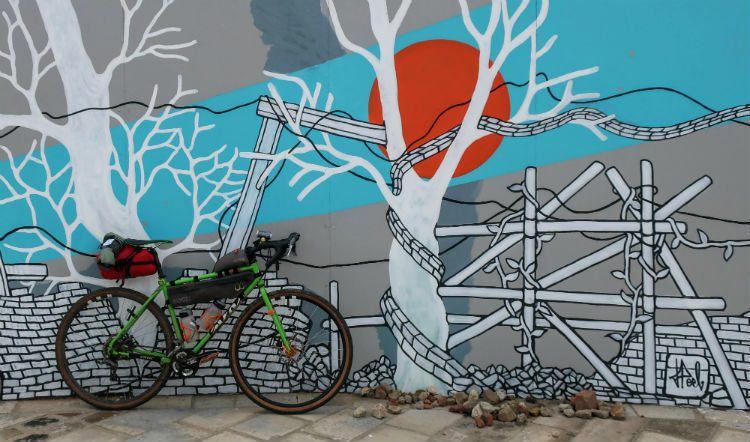 From here we anticipate a cruise downhill, but it’s not without its uphill sections, and the road is rough and rocky – it’s about the only part of the route where we felt MTBs might have been a better choice of steed. We pause to read the witches’ milestone, a brooding Pendle Hill just about visible in the distance, before the last section of rattly road and country lanes drops us into Slaidburn. Stupid brain! Why did you wake me up at 6am??? An overactive cortex means we’re up and on the road before it’s light. We roll through the lanes, marking time until we reach somewhere with an open café. The sunrise hints at glorious colours, but they never quite break through the clouds. Things the internet doesn’t tell you 5: where the cows will be on the road. Now the serious climbing begins, and up the Pennine Bridleway we go. Each slog up results in a swoop down (and in the case of one missed turning, an extra slog/swoop cycle). Another hill passes, and we roll into Colne. This is the biggest town we’ve encountered since Skipton, and the sudden increase in traffic is jarring. We pass swiftly through, past a mixture of period shop fronts and bargain basement Halloween wares. 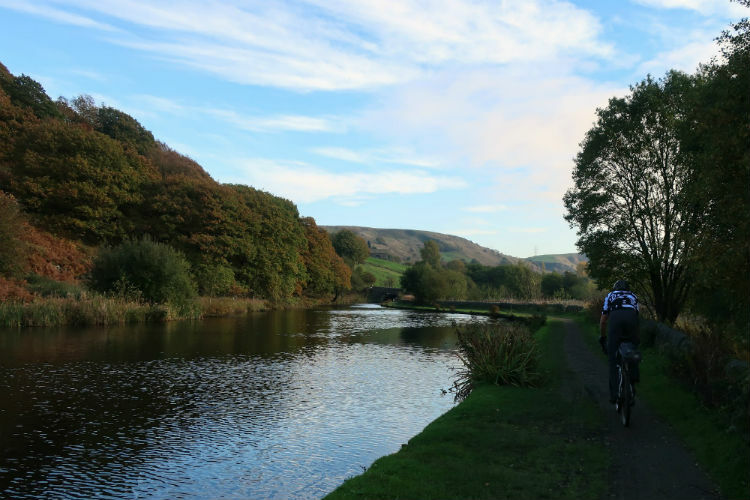 Trawden is the next place on our route, and it greets us with a stone signpost heralding “Trawden Forest”. There is a solitary, slightly apologetic shrub next to it. Again, there is nothing to keep us in a built-up area, and we climb onto the Boulsworth Hills. We exchange greetings with a marathon runner and disturb a kestrel from its brunch of mole. 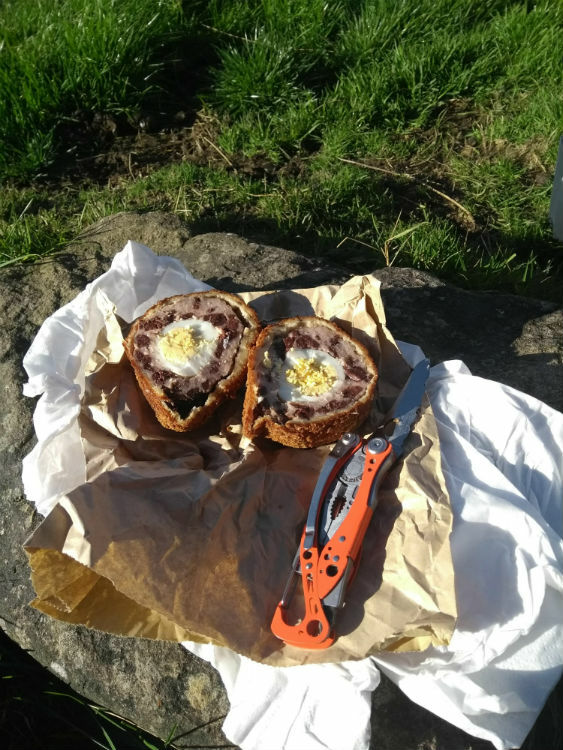 Things the internet doesn’t tell you 6 and 7: Ooh, there’s black pudding in this scotch egg! Also, precisely how good elevenses will be. Nearly at the top, we find a sheltered spot, and break for elevenses. We’ve been looking forward to this – an opportunity to make it worthwhile having brought the stove! Mugs of hot chocolate, and the monster scotch egg do wonders for our general sense of wellbeing, and fuel the legs for the last bit of climbing to the summit. The map shows many chevrons for the next bit, and we whoop down a set of switchbacks, before grovelling up another. Off the rough stuff, we spin along the tarmac to Todmorden for lunch. Here, we find “The Pub” (5 stars, would booze again) and the Little Bird Café (excellent tunes, and they send us on our way with a couple of excellent chocolate brownies). Canals are flat, right? Wrong. As we head towards Rochdale on the towpath, each lock represents a short but sharp, “Hill!”, before we reach the highest lock in England. From here, we have a gravity-assisted trip to Littleborough and the cheapest pub of the trip - £2.50 a pint! A spin past Hollingworth Lake takes us towards some very indistinct tracks to cross the M62. Things the internet doesn’t tell you 8: where to find the optimum level of swoop. Now we’re on the home straight. Not that it makes us much quicker up the hills, but there’s a hunger to make it to the last summit (where we will reward ourselves with whisky). 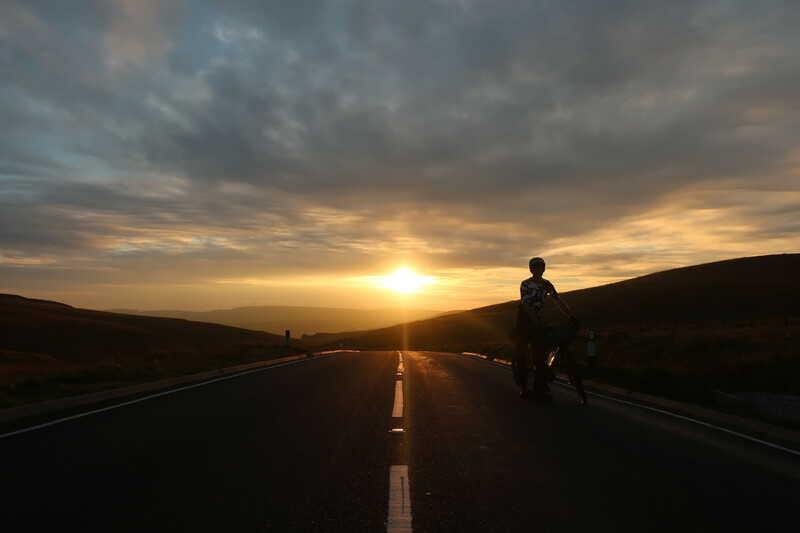 We reach the top just as a fantastic sunset kicks off, and have a quick dram before the sky goes full kaleidoscope. 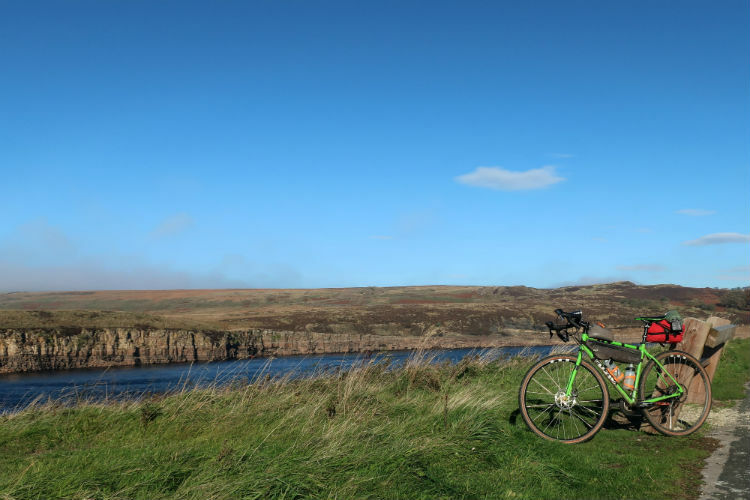 An amazing serpentine trail drops us towards Don’s house in Marsden – smooth, swoopy and downhill but not too precipitously. Just the ticket. Don is playing the role of casualty for the local mountain rescue team training day, so it’s a solo ride for me past approximately 87 reservoirs, and just the three significant hills before an easy roll home. The day dawns mizzly, the Wessenden valley shrouded in mist and silence. The calm in the valley is in contrast to the frantic clouds that are scudding across the hilltops. I see just two hardy souls on my way up, both runners. One seems to be doing laps… At Wessenden Head, I find myself in thick cloud, but I soon escape its clutches as I zip down the Isle of Skye road, aided by a brisk Westerly. The tour has so far done an excellent job of avoiding traffic, and I’m glad to turn off the main road and down a rocky bridleway. Things the internet doesn’t tell you 9: what time the cows have breakfast. Turning back into the wind slows my progress somewhat, but not as much as the herd of cows that have congregated around the tractor bearing their breakfast. I exchange greetings with the farmer, who assures me that the cows will be no bother as I make my way around them. Back on the bridleway, I wonder at the old paving slabs – how many years’ worth of wagon wheels must have rolled through here to carve out those ruts in the stone? The sun is now starting to burn off some of the cloud, but only in patches – I’m bathed in light, but above me, Holme Moss radio mast emerges like a Saturn rocket from a white-shrouded hilltop. A swift rattle down through the woods ticks off another couple of reservoirs before a steep climb is punctuated by an excellent opportunity to stop and admire some fungi. Rule of thumb, red = don’t eat! 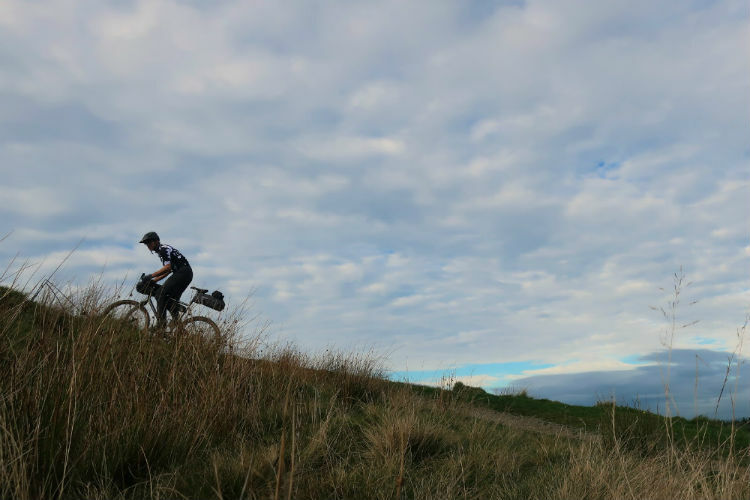 I’m nearly at the top of the last big climb now, and it culminates in delicious ribbons of singletrack that weave through a landscape pockmarked by old quarries and spoil heaps, long-hidden by moorland flora. I drop past the last reservoir of the day, and am soon on the Trans Pennine Trail, the old railway line speeding me back to Sheffield. Winter Miles = Summer Smiles!